Freida Pinto joined her co-star Kareena Kapoor Khan on the red carpet in Mumbai, India, for the ‘Mowgli: Legend of the Jungle’ premiere on Sunday (November 25). 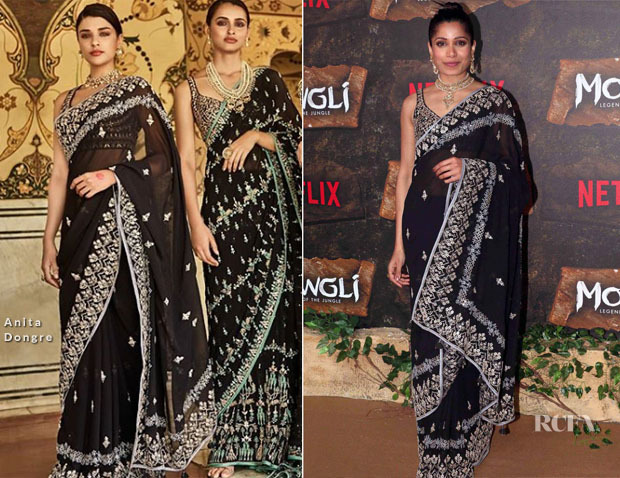 Unlike Kareena, Freida opted to go traditional wearing a Anita Dongre saree paired with matching sleeveless blouse. I’m not well-versed in Bollywood fashion, but I did find the Amrapali jewelry a tad overkill here. I can live with the earrings, but with all that rich embroidery, the necklace was too much.